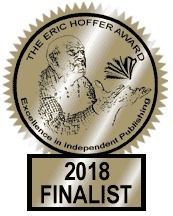 While I’m working on the 30/30 Poetry Project through Tupelo Press this month, I am not doing any work on the genealogy project! But I found something yesterday that I wanted to share. 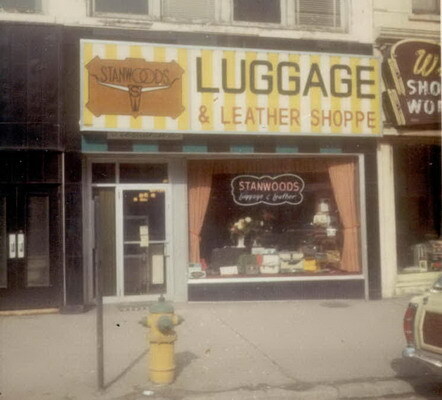 About 2 1/2 years ago, I mentioned that my father, and later my husband and I, owned Stanwoods Luggage and Leather in Kalamazoo. These photos are from the 60s and 70s. In that first post, I included this photo. There was a bell hanging from the front door so we could hear it open and close if we were in the back. You see Why Shoe Works next door? Dad was the last owner of that business. 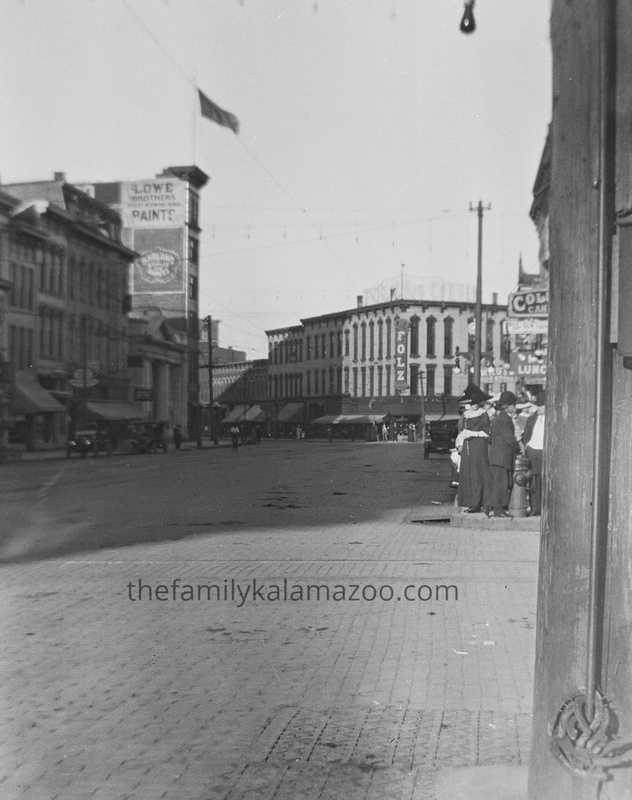 Every July the Downtown Kalamazoo Association would organize a sidewalk sale that most merchants would participate in. We always did, marking down items and putting them out in the heat for customers to pick over. 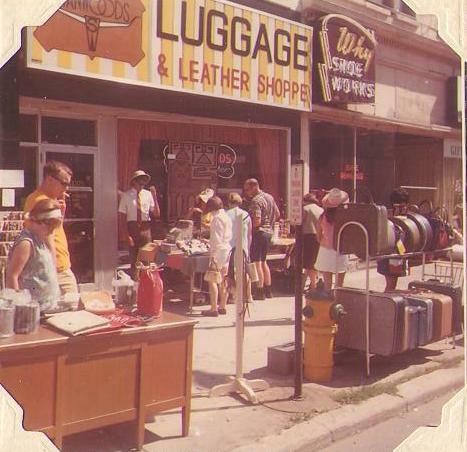 Here’s a photo of the sidewalk sale. I used to love working those for the excitement. 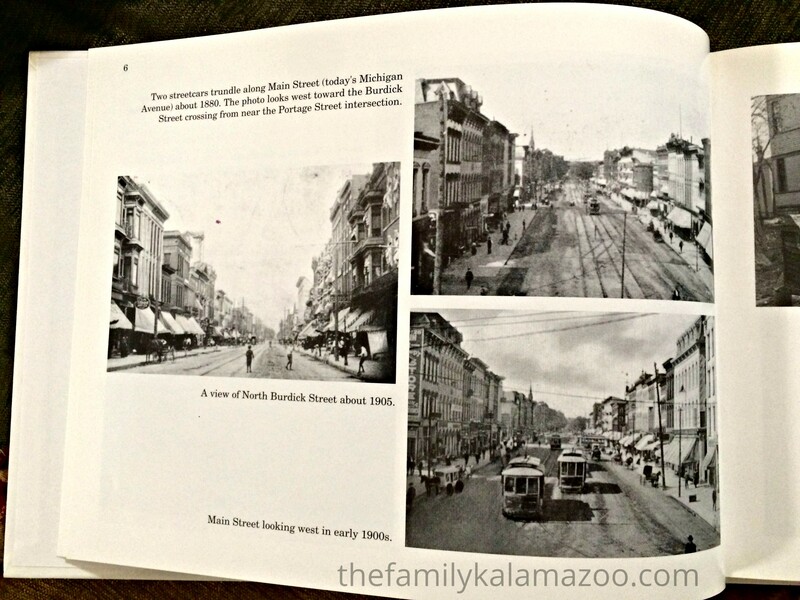 Dad would stand out in front with a megaphone, addressing people across the wide main street. Our routine was broken, I was out of the confining store, and I could people watch as they rummaged through our merchandise. Notice the round suitcases on the luggage display rack. Do you know what those are? Hatboxes!! We were still selling those in the 60s. Train cases, too. Those were boxlike suitcases where all your cosmetics and toiletries could stand upright. Today we use BAGGIES to carry our liquids. Yes, we’re definitely more civilized today. 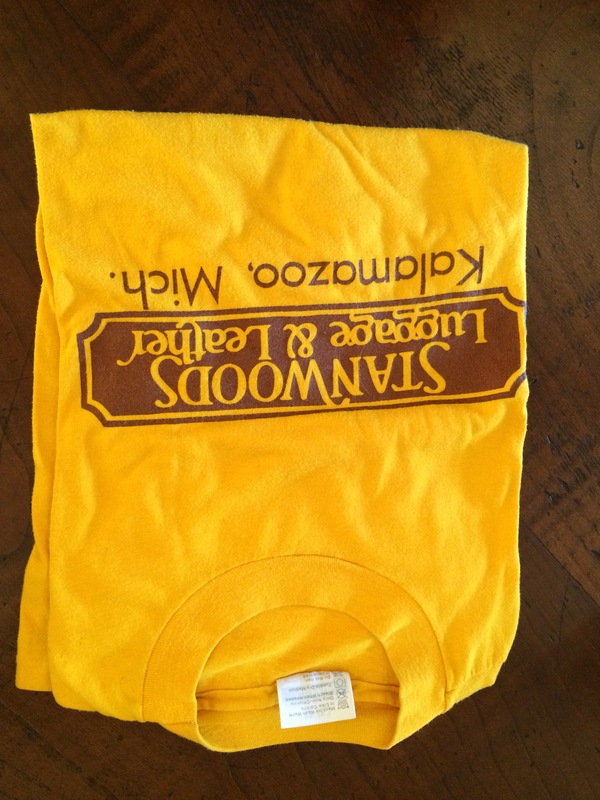 Eventually we had T-shirts made with a new Stanwoods logo and wore the T-shirts on sidewalk days. That’s what I found yesterday! The last Stanwoods T-shirt. 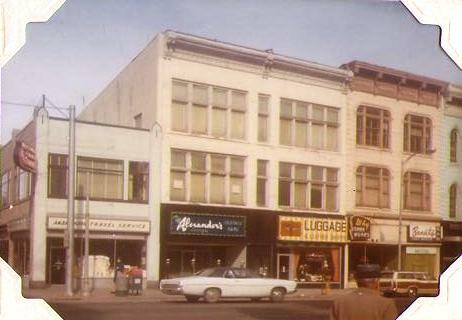 Here’s a photo of the block of E. Michigan Avenue where Stanwoods existed. I don’t know who lived in the house on each side in 1939, but I did 20 years later. Maybe it was the same people. 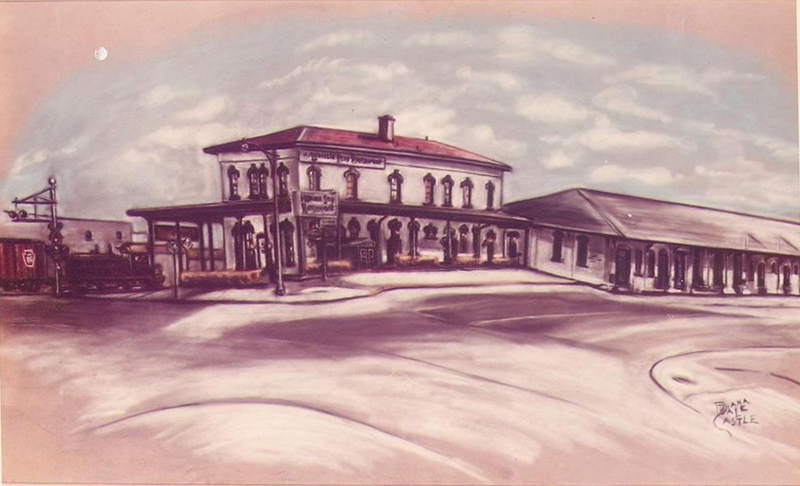 The man who lived in the house on the left of the photo (to the right of the station) was Willie Dunn. When I was newly married and he was moving, he let me have an antique oak library desk from the house. I’m looking at it right now. Simple Queen Anne legs and two drawers without pulls. Here’s a photo I’ve posted before–the view is different, so here you can see a sampling of the houses across the street on Balch Street. Any ideas on the date of this photo? 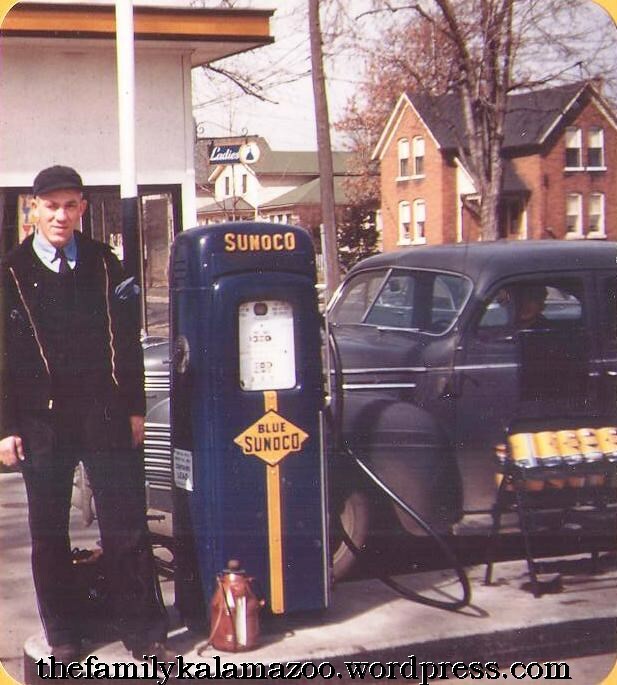 The pump looks different than the ones in the 1939 photo, and then there is the car to help. I bet Uncle Don would know! There is something to be said for such a fancy model, but it was probably more expensive to build and to maintain. In case you’re wondering, yes, people collect old gas station memorabilia–anything with a brand name and a logo! 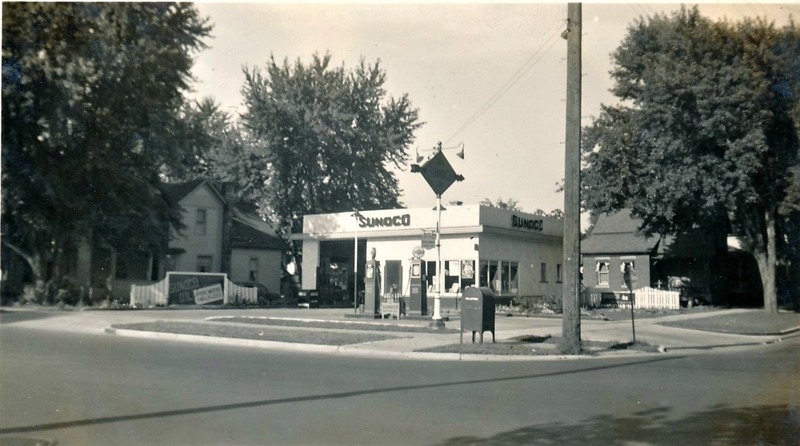 Here is what Grandpa’s gas station looks like today. Or shall I say the site of the station. You see that white house? You can see all the way to that house because Willie Dunn’s house is gone. When you were a kid, did you enjoy visiting or playing at or working at a small business in your family? It’s been a month and a day since I’ve written on this blog. One month ago today my father passed away. It seems both ages ago and as if it’s happening right now. 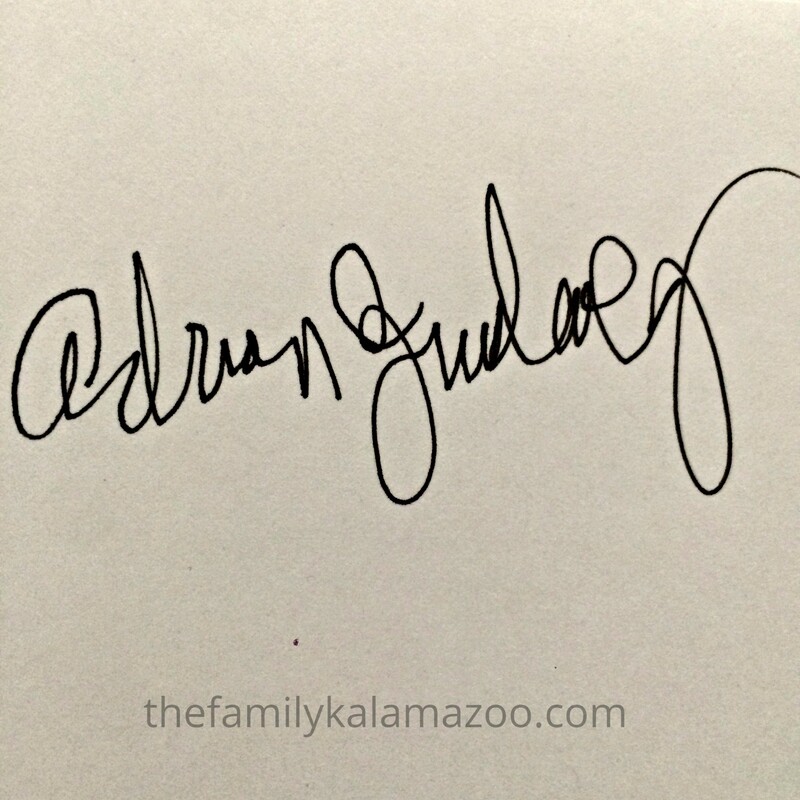 I am going to get back to work over here at The Family Kalamazoo, but I wanted you to know why I haven’t been writing any posts or reading your blogs. 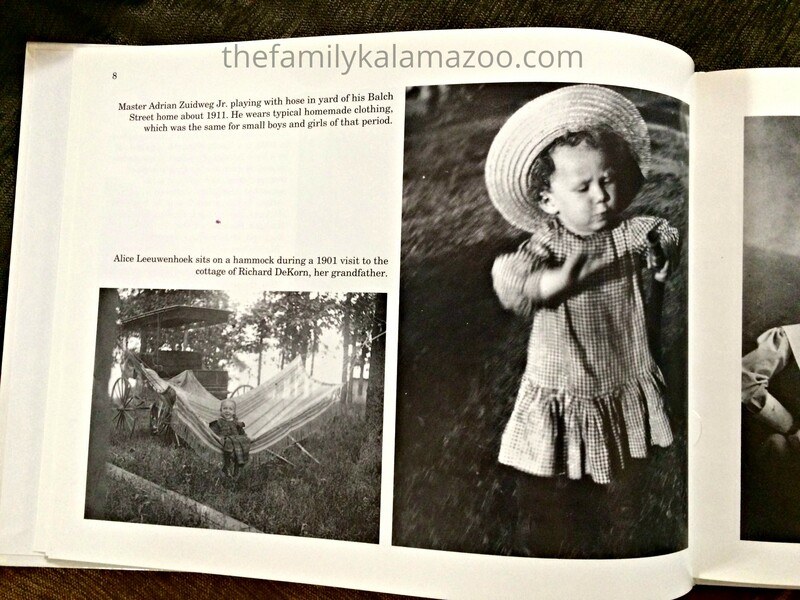 My father has shown up several times on this blog, both as a subject and as one of my family detectives. You can imagine how much he will be missed. The last post featured some of Dad’s yard art. 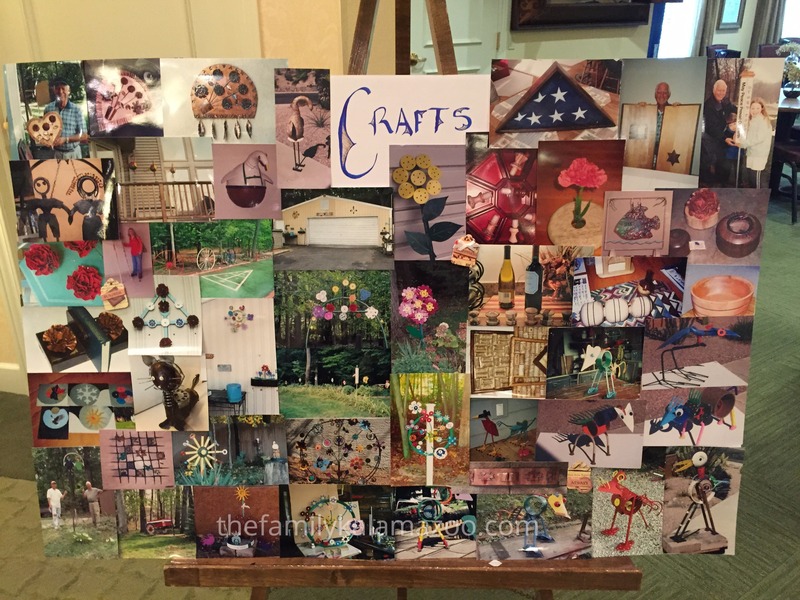 For his funeral, we covered a large poster board with photos of some of the items he made through woodworking and metal scrap art. Dad was always doing something, always involved, and always present in every moment. 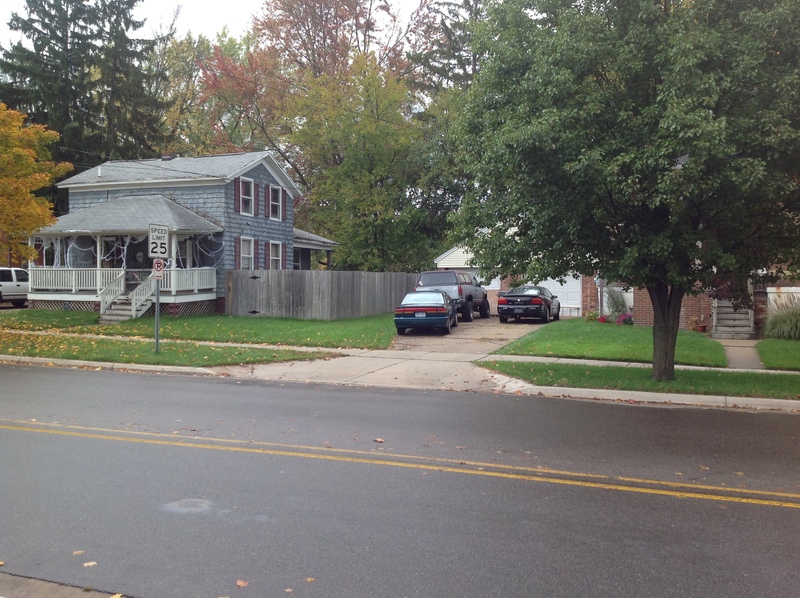 Richard DeKorn’s house is still standing, at the corner of Burdick and Balch Streets in Kalamazoo. Someone lives there, but the house needs some TLC, in my opinion. I wonder if the owner knows who built the house–or is interested. 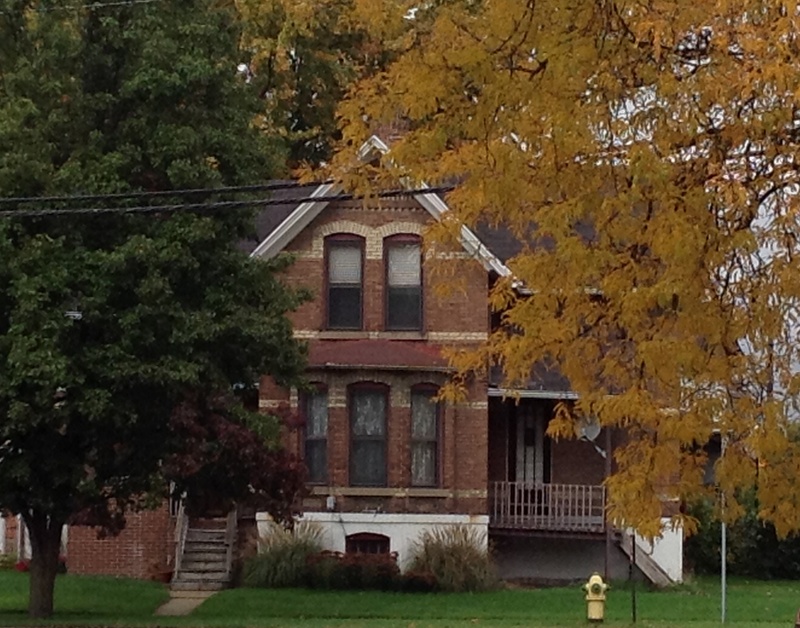 I love the distinctive light brick stripes on the dark brown brick. 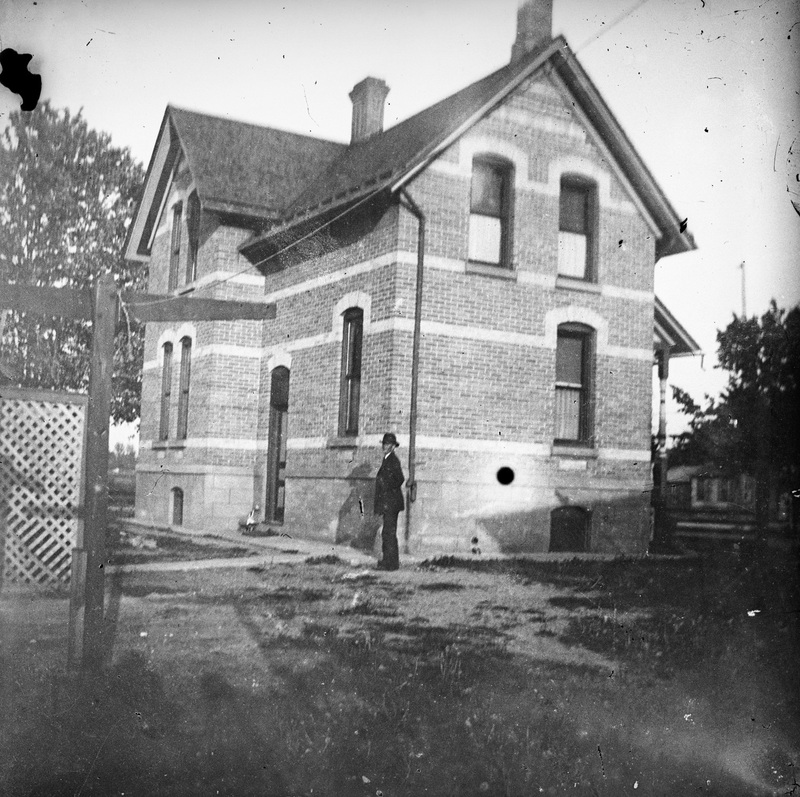 The house was most likely built in the 1880s. I would love to know the exact year. Although the basic house hasn’t changed, the property has. 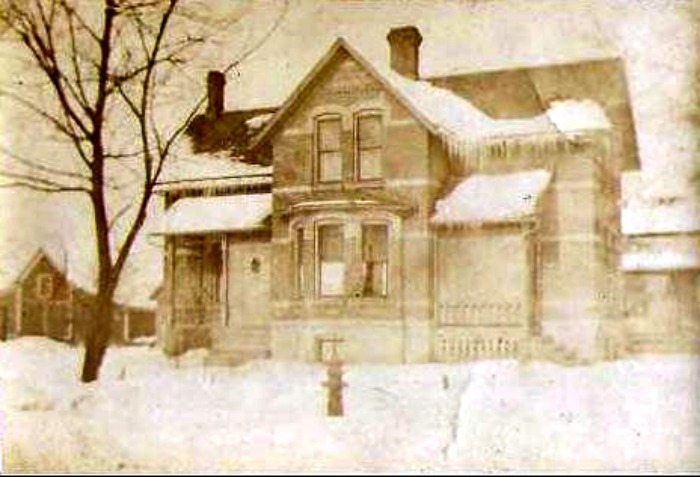 In the old photographs, the house looks set back from the street. The house number is now different. It looks like a barn to the left, doesn’t it? Notice that the above photo is the same view as the first photo. Is that a fire hydrant in the same spot? Did they have fire hydrants in those days? Or is it something else? Here is a photo of the area where the barn was. I wonder if the garage has the same footprint as the barn. And you can see the house that is next door. How old do you think the gray house is? In the following photograph, Richard DeKorn stands by the house he built. 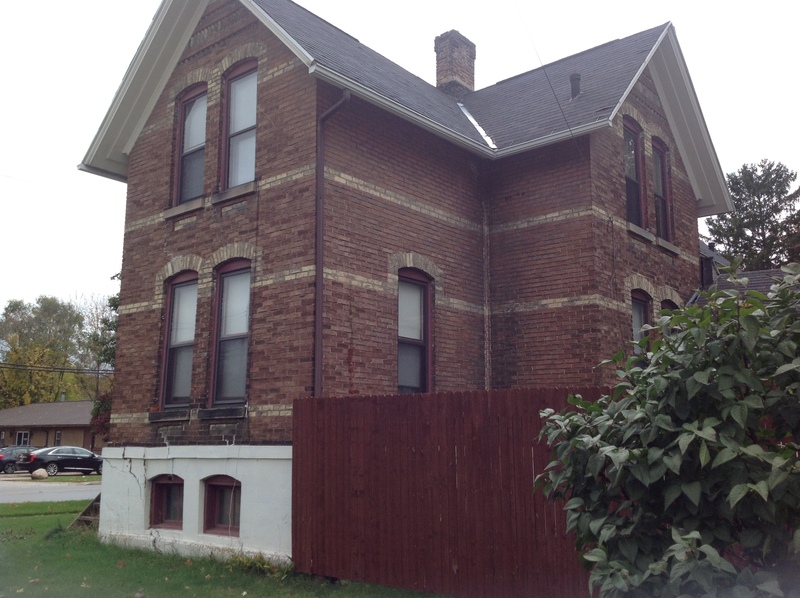 In the above photo, the right side (two windows in 2nd story, 1st floor, and basement) faces Burdick Street. 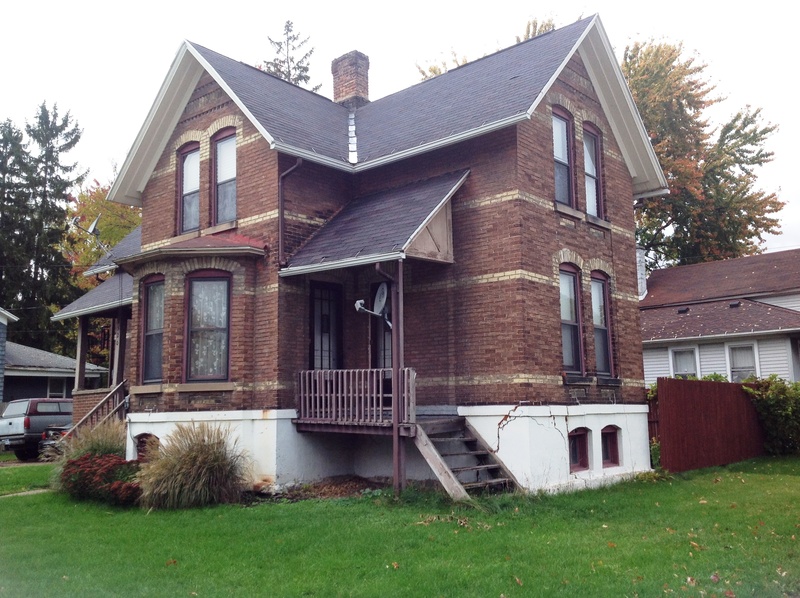 The left side (two windows 2nd story and three windows on the 1st floor and basement) faces Balch Street. In the old photo, where is Richard standing? Is he at the opposite corner from the Burdick-Balch corner–at the back of the house? Here’s a view from the opposite side of Balch. 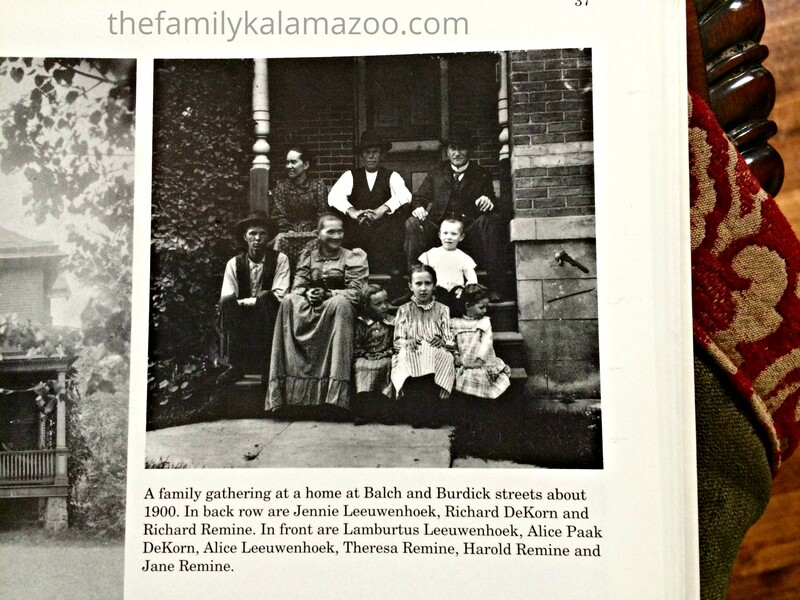 I think it shows that Richard has his back to Balch Street in the old photo. 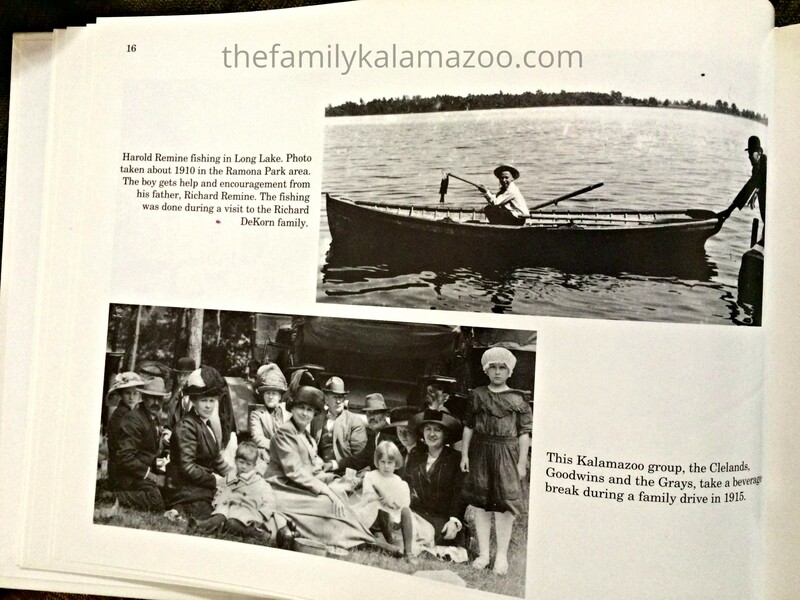 Although I’m in such a busy period that I can’t work on genealogy, I do have my daughter’s help right now to scan some old photos, so I will post some of them while I am too busy for research. On the back of this photo it says Frank Tazelaar (near Whistle Stop). So I looked up Frank Tazelaar on my family tree. Sure enough, he’s on there. He was born January 17, 1876 in the Netherlands, to Pieter Tazelaar and Adriana Bek. 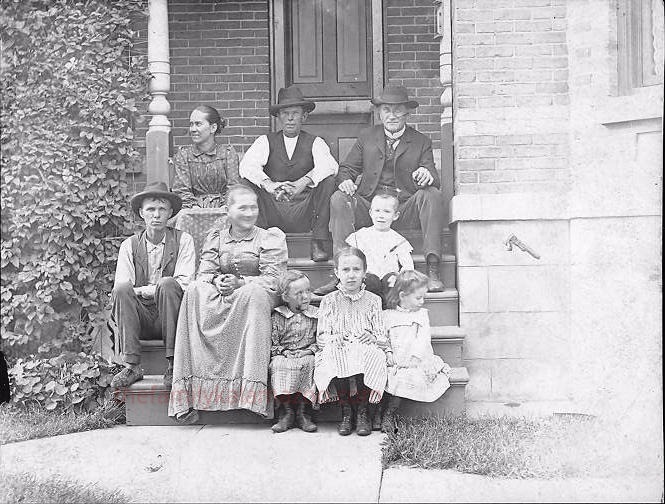 The family immigrated to the United States when he was 12, in 1888. On July 9, 1906, he married Genevieve Remine in Chicago. Genevieve was my first cousin 3x removed. Frank died in 1950. So what is “Whistle Stop”? It’s the train station. 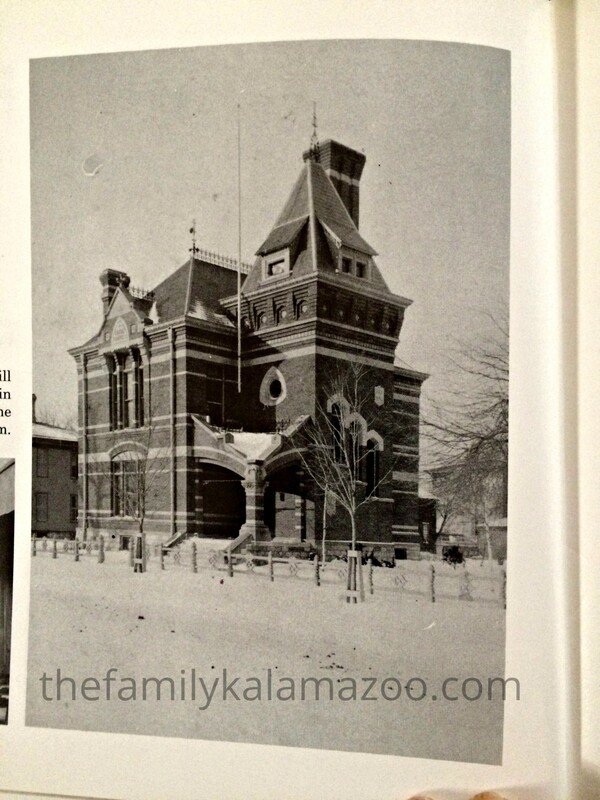 But when I tried to figure out if it was the same Whistle Stop where my friends and I used to go to eat and drink (and a building that my father owned) or if it was the other train depot (where we owned a concession stand with my father), I discovered that there were actually seven train stations in Kalamazoo. 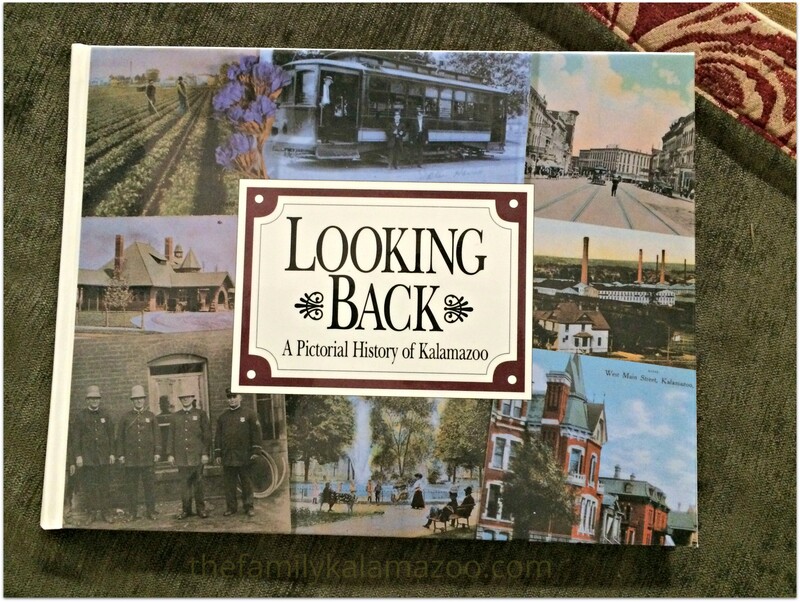 Here is a fascinating article that says that Kalamazoo may have had more train depots than any other city. 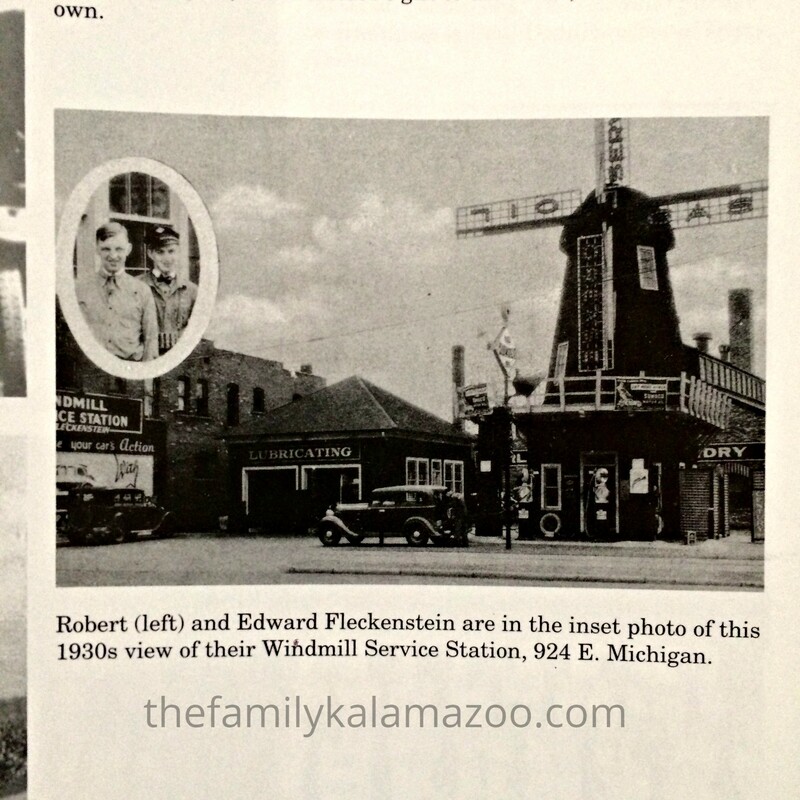 I am going to tentatively assume that this photo was taken near what I knew as the Whistle Stop. 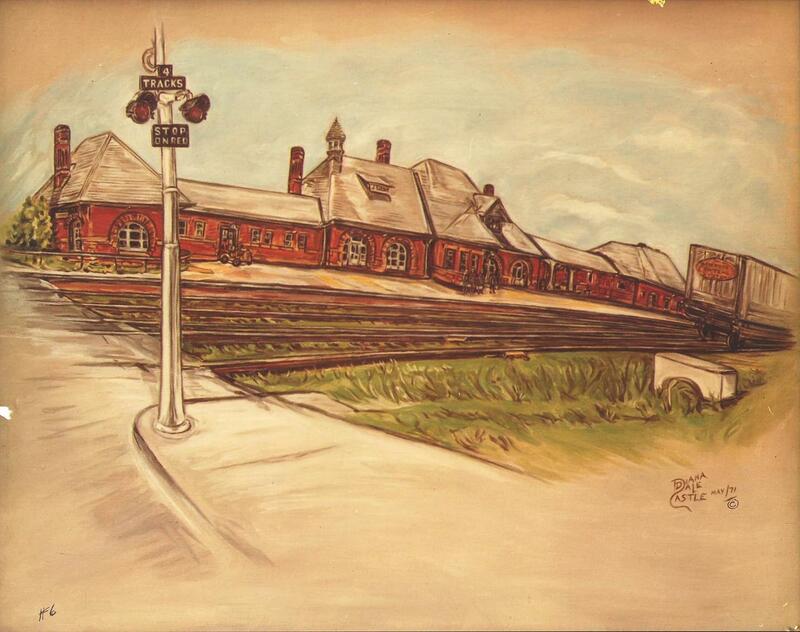 Here is a painting my mother-in-law did of the Whistle Stop. I apologize for the flaws in my copies on the computer for the next two photos. OK, dad correct me if I made any mistakes! What does the date on the photo of Frank Tazelaar say? Is it 1904 or 1914? 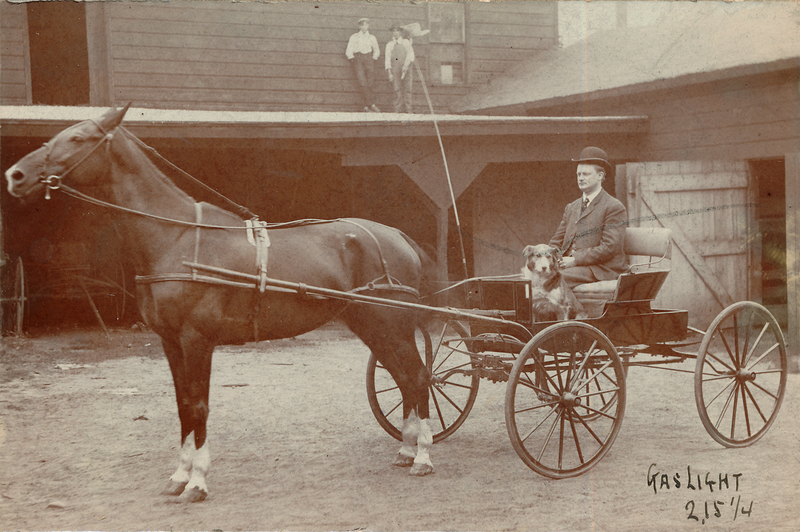 Be sure to note the type of rig he was driving, the dog, and his clothing compared with the men up on the roof. What is that pole thing coming down from up there? What do you think Gaslight means? The mark (pencil or crayon?) going through the photo wasn’t noticeable until my daughter scanned it. 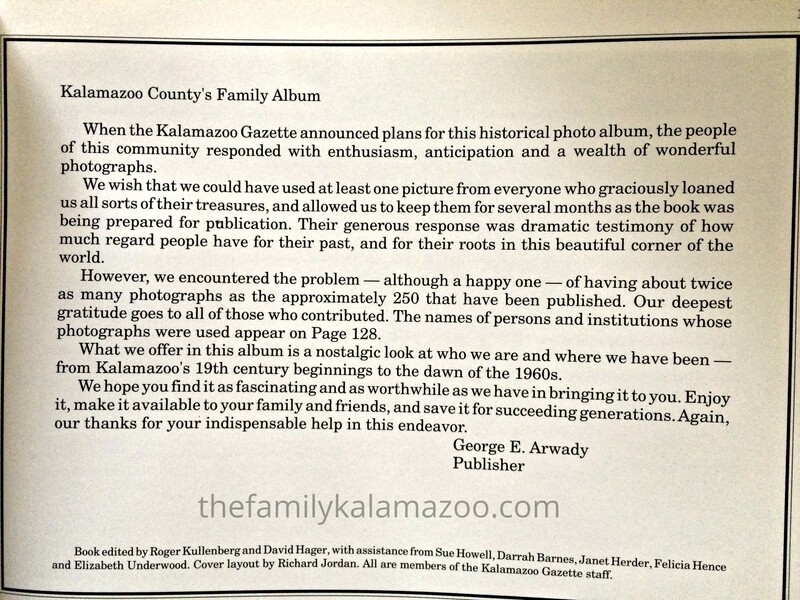 And thanks to Amberly at The Genealogy Girl she is scanning into .tif files.